Some raindrops spattering my tent were the only noises in the night. Even with a casual breakfast and packing the trip to “Split Rock” was under way by 8:30. The new portage route worked out great. During the night a Caribou had left droppings near the north end. After the portage the park map came back out for navigation. A glance at the map to get an idea of my next portage and then I do not worry about keeping track of my exact location until getting in the area of the portage. 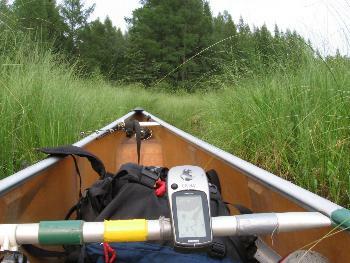 The GPS is then used to show the exact location of the portage, which has been recorded in the GPS on a previous trip. Using the GPS sparingly like this will only deplete two sets of batteries in a month. Rain was on the way so the pace was ratcheted up a notch or two from my usual saunter. The lost portage to “Splitrock” was reached at noon and lunch of Mac and Cheese prepared. It would have been nice to push on and get to “Splitrock” before it rained but my batteries needed recharging. Someone had been here earlier in the summer and blazed the portage trail and hung some flagging tape. They had done really well finding the route included with the 2005 journal but eventually missed a corner and blazed a route into some ugly terrain. The rain arrived as I got my canoe through the portage so I propped it over a rock and took a break until it quit. On the way for another load I could see that the person with the blazing axe had found the right path and blazed it too. These lake names in quotation marks are names that I have assigned to make the journal easier to follow. These lakes may have traditional names that are not on my maps. The names I use usually refer to some attributes or terrain or shape. 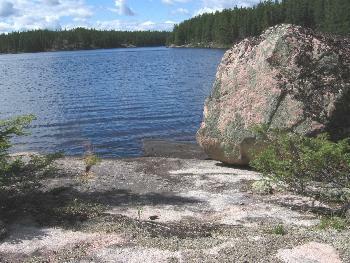 “Splitrock” is named for a large boulder that has broken in half and fallen into place as a great chair. A camp was set up but my rain fly has shredded so the tent is erected under the rain tarp. The Eureka Timberline Three is at least 12 years old and has been used a lot. I like the tent enough that a search for a new fly will be done when I get home. The wind was blowing into my camp so it was not surprising that a Walleye hit the pink Dardevel. When suppertime arrived the fish was taken off the stringer and the canoe paddled to a different shore. Unless required by the weather my fish are never cleaned or cooked at my camp. Bears are not a problem in WCPP but any living around a lake with many visiting fishermen soon learn that a shore lunch means scraps for them just as the gulls do. The gulls are so efficient at this that most of the bears may never have a chance to learn about it. There may have been a Caribou calling last night. Not high pitched like an elk but the same type of call. Sitting in the morning sun and out of the wind it was surprising how cool it was once I was out on the water. The rest of the morning was spent cleaning up the last portage by throwing off logs and scuffing up some of the moss so that it can be easily followed. If the park can get to it with a chainsaw in 2008 there will be no problem with the errant blazes on the trees. Trolling the pink lure along a rocky shore produced two Walleyes for the day’s meals. After frying one for lunch a trip over the next portage showed there were many errant blazes near the south end of the portage. Hopefully when the park clears the trails no one will be tricked into using these routes that end up on the creek below the rapids. When I was there the water levels were too low to even pull a canoe. When I checked at the other end my canoe would not even fit in the channel. They also use a dangerous traverse around the rock cliff that should be avoided by going up and over the rock. A quick stop at camp to pick up the fish and resupply the cook pail and it was off to a sheltered rock for supper. It has been a good time here on “Splitrock.” The scenery is much tamer than the grandness of Royd Creek A bonus here is a lot of interesting rock groupings. Let’s not forget about the Walleye. For a Walleye lake this is a nice one. Most of the Walleye waters have much blander shorelines. Wednesday morning I pulled the canoe through the creek to the next small lake. The water being too low to go through fully loaded. Approaching the portage to “Boot Lake” I lifted over a riffle of small stones and was able to make my way to the top of the rapids. This shortened the portage as I laid it out a few years ago and made it simpler. 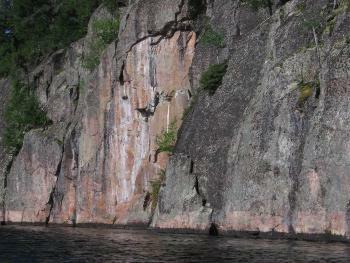 The wind was blowing up “Boot Lake” and I let it do the work as I enjoyed the cliffs on the north shore. A search is always made for art on the rocks but none has been spotted. Several places on the south shore might serve as campsites but nothing really stands out like the ones on "Splitrock.” After the next portage my favorite lunch spot was just ahead and right on time. The next short portage put me into a stretch of water that would take me to the Irvine portage. The pink Dardevel was trolled but the wind was pushing at too high a speed. About an hour later a protected area allowed for a proper troll and a Walleye soon hit the lure. A rainsquall was blowing through so the tarp went up on protected bay for an early supper. The skies cleared by the time I had eaten and the wind really kicked up the waves. I rode with that wind right into Larus Creek and up to the Irvine portage. The slot portage was as nice as I remembered it. A very unique passage but nasty to maneuver through. We are flying into in to Irvine Lake in late September so I wanted to look for a good fall campsite. We came in 2006 and set up a camp on the largest part of the lake but I chose a site on the smaller arm of the lake that would give us good protection against any wind related to the north. It will have sun until late in the afternoon when the sun goes behind one of the protective hills. One hundred feet of a wrap around rock porch will provide great places to relax and enjoy the fall colors provided by all the Birch and Aspen. Two nice landing places for canoes and two locations near the water for fires should add to the pleasure. It had been a full day and the pudding was finally enjoyed after sundown. Thursday morning a few casts from shore provided two Walleye. One used for a breakfast of fried fish and hash browns. The other put on the stringer for supper. Fortified with that special meal I piled all the dead logs to open up places for tent pads. The older we get the more we want to sleep well away from others. The first step is to stop sharing tents. Soon all the tents end up a long ways apart. The sites I have cleared should make everyone happy. They will not hear the neighbors snoring. A few of us will skip the tents since bugs will not be a problem. If rain dampens our plans for a night under the stars a quick move under our array of tarps will keep us dry. 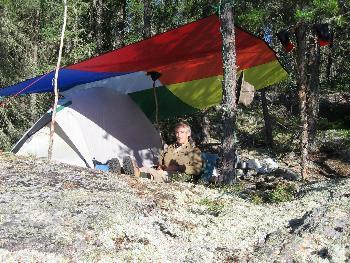 The tarps are an important part of enjoying a fall trip. When the weather turns against you the tarps preserve the good times. On one particularly brutal day we used them to form a wall tent and used a stove and lantern to ward off hypothermia. The lantern is always carried on a fall trip so that we can play all day and then fix our supper by its light. With the shorter hours of fall it gets well used in the evening and makes a great emergency heater. With the chilly mornings keeping us in our cozy sleeping bags until someone else has the first pot of coffee simmering it is seldom used then. My plan was to go down to the portage exiting Irvine to the south and get it ready for tomorrows travel. Cold rain showers have put that plan on hold. My fuel is running a little low and this is where I planned on doing a little cooking over a wood fire but that will not work either. The first four quarts of fuel lasted me 21 days but with more Walleye to fry and the cooler weather my last quart needs some help. At lunchtime my thermometer was reading 55 F. Once more the tarp has kept it a pleasant time in camp. This year I have a new 12 foot by 12.5 foot multicolored tarp made by Cook Sewing. There are 40 tie down loops plus a reinforced center square for a center pole. It is so versatile that I experiment every time it goes up. The multi-color really stands out in this country and that is its purpose. If I need to call for assistance an airplane can easily spot it. During a break in the passing rainsqualls I headed south to the portage. The wind had the waves really rolling on the main body of Irvine. More rain caught me as I crossed but the worst part was how the wind really picked up as the squall passed over. After finding a better route to use for a portage I headed back up the lake and into the waves. In the worst parts I was straining pretty hard on the big kayak paddle to prevent being swept parallel to the waves. Some disdain the use of anything but a single blade paddle in a solo. Unless there is something I was missing in using my single blade I think anyone using one today would be enjoying the view from land. I was pleased to see that with that strong NW wind the water was calm in front of the proposed fall camp. Friday morning I was trying to catch a Walleye for breakfast and lost a few before getting them in the pan. A cast over by some weeds produced a hard strike. I set the hook and broke the line. The line was lying on top of the water so I launched the canoe and grabbed it. Pulling in the line by hand it soon became evident the fish was still on the line. With only a little line left a Northern with a head bigger than my hand came into view. One look at me and it jerked away and broke the line again. There had been 17 fish -frys on the trip so far, nine Northern and eight Walleye. There was plenty of food in my pack for the rest of the trip so I stowed the fishing gear rather than rigging it up again. A Double Crested Cormorant was sitting on a rock near the portage when I said goodbye to Irvine. The new portage route worked out fine and it was easy to follow. The route I had laid out a few years ago proved to me very hard to retrace when we tried to follow it last summer. I have found that retracing the routes can be very tricky sometimes. If the woods are fairly open it is just best to keep close to the route and not worry about it. In denser areas and in areas of rough terrain it is more important to look for the scuffed moss and clipped brush denoting the exact path. My camp is at the portage start on “Salamander Lake.” My days are running short or I would have stopped for the night two lakes back and done some exploring. It is also a lake that I feel has some huge Northern feeding in it. I sleep in a little longer this morning as a light rain ticks on my rain tarp. After my usual cereal breakfast I take a hike back over the half-mile portage just to enjoy the country. 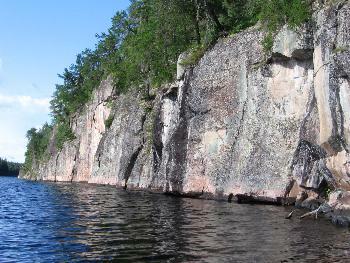 Half the portage is on smooth, flat and open rock. Portage walking does not get any easier than its smooth seamless rock. The afternoon journey to Royd Lake went smoothly. Another tailwind allowed me to drift down between the high rock walls toward my intended campsite near Royd Creek. There is cabin on Royd and Jon, one of the partners, has been following my travels in WCPP. Every time I have passed through the camp has been vacant. We use E-mail each year to see if our schedules are going to allow a meeting on Royd. This year there is a chance he might be there and as I cross the lake activity is seen on the island. I pull up to the dock and Anne comes down to meet me and I find out that Jon is here this time. An invitation to come up for a cold beer or a cocktail is accepted. After visiting for a while this turns into staying for a dinner. Jon grills the Lake Trout and Anne prepares fresh lettuce salad with real tomato and potatoes. All things she knows will be appreciated after eating out of a backpack for a month. After a great visit and a grand meal I paddle down to the site near the creek and put up my tent and tarp. Travel is now on very familiar waters but I keep track of the miles and time it takes to cover them for future reference. It had taken about 10 hours to come from Irvine to the Royd camp. The five miles down the creek to Donald Lake took 3 hours but I went the whole 20 miles to the 375 steep hill portage between the Haggart River and Broken Arrow Lake in a total of 12 hours. From the portage to the dock on Wallace is another 20 miles and took a wind assisted 9 hours. Doing a little checking I found that it would be 12 miles from the Royd camp to Joey Lake, which is east of Lightning in the headwaters of Royd Creek. Coming in from Wallace Lake it is about 50 miles to either Irvine or Joey Lakes. With the maps spread out I am already plotting a route in from the east. Starting at Johnson Lake and coming through Indian House to the Prairie Lakes, it looks like a way can be found to access Joey Lake and Royd Creek that will be a lot shorter.